The 20-member Soweto Gospel Choir entertains audiences with its blend of African gospel music, spirituals, and American popular songs. 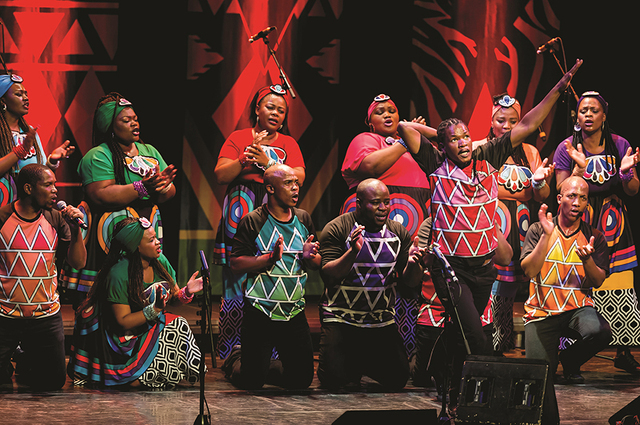 Soweto Gospel Choir, known across the world for its mesmerizing performances, will return to Eisenhower Auditorium November 27 with Songs of the Free, a program celebrating the 100th anniversary of the birth of Nelson Mandela. The Center for the Performing Arts at Penn State presentation – part of a 50-plus-city tour of North America – includes South African classics, freedom songs, and gospel music loved by the late South African president. The captivating 20-member ensemble thrills audiences with its blend of African gospel music, spirituals, and American popular songs. Earthy rhythms and rich harmonies, sung in six of South Africa’s 11 official languages, combine for performances that uplift the spirit. The tour follows the September release of the choir’s Freedom album, which features liberation songs from South Africa and beyond. The recording includes songs written by Miriam Makeba, Harry Belafonte, Letta Mbulu, and Mbongeni Ngema (creator of the musical Sarafina!). The album’s songs are sung mostly in Zulu, Sotho, and English. The first single from the album, “Umbombela” (“train song”), speaks of the suffering endured by black South Africans during the apartheid era, when migrant workers were forced to travel far from their families to meet the oppressive economic and political demands of the government. “Hailing from the township that was at the heart of South Africa’s long struggle against apartheid, this choir has the spirit of gospel deep in its blood – and it shows,” writes a Washington Post reviewer. The choir, which made its Penn State debut in 2007, delivers a universal message of love, unity, and hope. Since emerging on the global music scene in 2002, the ensemble has earned two Grammy Awards and had two albums reach No. 1 on the Billboard world music chart. The group’s divine talent has prompted collaborations with international superstars, including U2, Peter Gabriel, Robert Plant, Aretha Franklin, Pharrell Williams, and Stevie Wonder. Various free engagement activities will take place in conjunction with the choir’s visit to State College. For details, go to cpa.psu.edu/events/soweto. Foxdale Village, A Quaker-Directed Continuing Care Retirement Community, sponsors the concert. The presentation is part of the Center for the Performing Arts Diversity and Inclusion Collaborative. Penn State’s Equal Opportunity Planning Committee provides lead funding for the collaborative. Sandra Zaremba and Richard Brown provide support. For tickets or information, go to cpa.psu.edu or call (814) 863-0255.